Well the time has come and if you have any Princess Sofia fans in your home you know the questions you have been asked waiting for this release. Mine asked every morning, “Is today the day?” “The new SOfia DVD comes ith a necklace, right?” Yes- that’s right The Secret Library DVD has arrived with necklace in tow! Woot woot … you need to add this to your DVD collection, I promise this is a good one. My daughter did not take the necklace off all day! Have a look at all the wonderful activities that go with this movie! 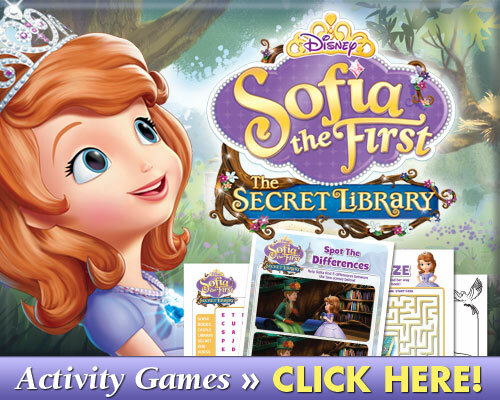 Sofia the First,The Secret Library DVD is a must have for your Disney Junior library. My favorite is Clover…. who is yours? This DVD boasts two special appearances, one from Olaf from Frozen and the other is Princess Merida from Brave and as a special bonus there is a Sofia the First necklace inside the DVD. I know that my special princess can’t wait to watch this DVD as Sofia the First is top on our list to watch on the Disney Channel these days. Personally I think Clover is the bomb and love his singing and dancing. Sofia’s Aunt Tilly returns to give her a gift that will unlock a secret world and appoint Sofia storykeeper of magical books without endings in “Sofia the First: The Secret Library.” Follow along as Sofia pursues adventures that will finish the narratives, including rescuing Minimus’ brother from an evil prince and setting out on a mission to stop Miss Nettle from stealing all the beautiful snowdrop flowers from the wintery kingdom of Freezenberg. Merida from Disney•Pixar’s “Brave” and Olaf from Disney’s “Frozen” make special appearances.